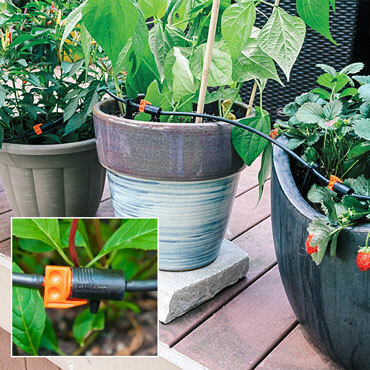 Use this Drip Irrigation Kit to directly water the roots of your plants and save on water. This drip method applies low-pressure water, slowly and evenly to your plants. It is convenient and a real time saver. In-line drippers adjust irrigation and are easy to clean. Kit includes: 1, 3/4" pressure reducer; 1 automatic adapter; 1, 1/4" threaded hose adapter; 1, 65', 1/2" hose; 3, 1/4" shut-off valves; 5, 1/4" tees; 10 hole plugs; 20 in-line drippers; and 20, 1/4" support stakes. Assembly required; instructions are included.